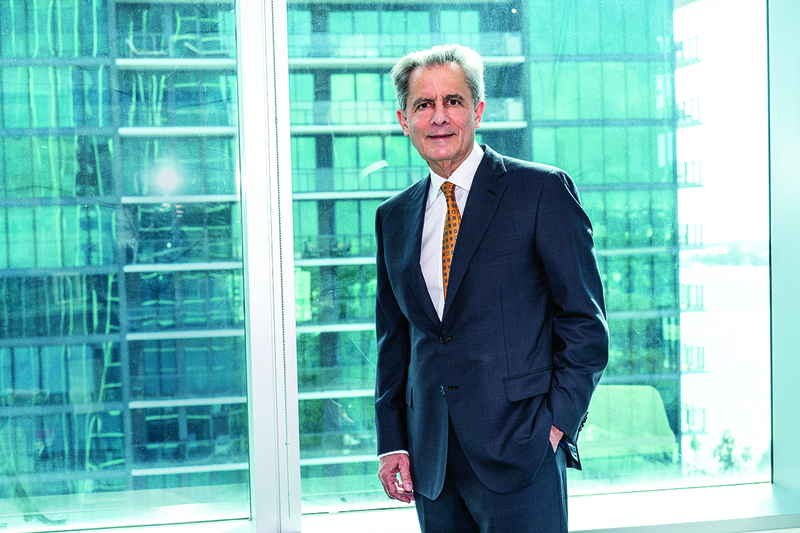 Tony Argiz has been chairman and CEO of Morrison, Brown, Argiz & Farra since 1997 and helped propel it to be one of the top 40 accounting firms in the nation. One sign of his acumen is his company being a 21-time honoree on Inside Public Accounting’s annual list of the nation’s 50 best-managed accounting firms. Argiz has extensive accreditations in accounting, including appraisals, business valuations, financial forensics and fraud examinations. He has been a council member and on the nominations committee of the American Institute of Certified Public Accountants. Among his extensive past and present civic positions are chairman of the Adrienne Arsht Center Foundation, Facts About Cuban Exiles, United Way of Miami-Dade County, the Florida International University Council of 100 and the Miami Dade College Foundation. He has been widely recognized with numerous awards from schools, charities and news organizations in South Florida, including an SFBW Apogee Award as chairman of the year in Miami-Dade County. He was honored on Feb. 13 with a Sand in My Shoes Award, which is the Greater Miami Chamber of Commerce’s most prestigious award. Argiz was interviewed by SFBW Editor-in-Chief Kevin Gale. The following transcript has been edited for brevity and clarity. You have had what many people would call an incredible life journey—coming to the United States from Cuba as part of Operation Pedro Pan, building the region’s largest local accounting firm, and then becoming one of the most honored people in South Florida for your business and philanthropic accomplishments. When you reflect about all of that, what pops into your mind? I think more than anything, how fortunate I am to have a wonderful family and wife of 42 years with three kids and grandkids and the type of support I’ve received from principals and colleagues here at MBAF. If I just lead, they make it happen. I’ve also been extremely grateful to be in the United States. It’s what drives me to give back every day. Tell us about your childhood memories of Cuba coming to the United States and then having to spend years at a boarding school operated by Catholic Charities. How did that help mold you? Life in Cuba was great until about a year after Castro got there. I had a beautiful family—amazing parents, uncles, aunts and siblings. I was provided the opportunity to go to excellent schools—kindergarten, first grade, second grade, great tutoring. My mom had a very tough decision. They were listening to propaganda that kids were going to be sent off to Russia and separated from their parents. Eventually, my parents wanted to get out and didn’t want to take any chances on my part. I still remember the day my mom says, “We’re going to send you to the United States.” She took me to Pan American Airways in an area of Havana to get all my paperwork. Then, like a week after, I left the country: March 24, 1962. My mom would tell me, “You’re only going there for 30 days, 60 days, 90 days.” Meaning this thing will be over and Castro will be gone. Castro will not be allowed to stay in power more than that period of time. At the same time, I think she knew better, but she didn’t want me to worry about it. They sent me off when I was 9 years old. I was fortunate the Catholic Church and Operation Pedro Pan took me in. They were my legal guardians and run by the Salesians of Don Bosco. They were basically my family for five years until my parents arrived when I was 14. During all this time, I was extremely grateful to the Catholic Church. They provided education, room and board—everything into making me a caring human being. When you’re without your parents at that age, I think you mature and grow up very quickly. The leadership I saw in school and how competitive the school was in academics and sports really helped me out. I received a baseball scholarship from several places and among them was this brand-new institution, Florida International University. I received an accounting degree and met my wife. After graduation I was planning to get back to Tampa, and she said, “I’m staying in Miami.” I got a job here. I don’t think I could have been as fortunate as a Cuban immigrant compared with what I could have done in Tampa and New York City. I’m always thankful for the opportunity the city has given me. What was your early accounting career like? I read that you were actually fired from your first job. It was well deserved. It was a kick in the rear that I really needed. After that, I noticed right away that in order to get to the top anywhere it’s constant study and hard work, meeting new people and making connections. I found accounting was not only a profession, but a business, too, and I had to increase production, become more technical and elevate myself at wherever I was going to work next. How do you feel about the future of Miami and South Florida, in general? Where do you see us excelling and where do we need to improve? We are a city of immigrants and we are going to be successful because of that—the hunger and drive that’s in our city is in our bloodlines. We almost brought “HQ2” (a second headquarters) here from Amazon. I think the Beacon Council did a good job. We have growing universities and a growing college population. It’s an amazing future that I see in Miami. I wish I was 30 years old. I think Miami really needs to fully address transportation issues. I’m hopeful about Brightline and what it will do with traffic up and down the east coast. It will get cars off the road. Major cities, such as Chicago and New York, have amazing rapid transit. It’s hard for workers in Homestead when it comes to how long it takes to get to the beach or downtown Miami or Coral Gables to be able to work. Do you ever go back to Cuba? No, I’ve not been back since I left in 1962. I would like to take the kids and grandkids to see where I was born, the schools I attended and where my grandfather took me all over Havana. I always wanted to see the Cuban countryside. Do you see a path to change in the Cuban government to have a more open and democratic society? Honestly, at this point in time, I don’t, but I have the hope and expectation that we will get through this extremely difficult situation. You have the Castro family that thinks they own the island. They didn’t build it. They sold every asset they gathered and now they don’t want to lose it. How did the culture at MBAF contribute to it being named a 21-time honoree as one of Inside Public Accounting’s Best Managed Accounting Firms. The key are the people. They are our biggest asset, even though they might not be recognized in our balance sheet. Without their work and without their effort, we wouldn’t be the firm we are. We want successful and happy colleagues. When you’ve got successful and happy people, you are going to have great returns on the financial side in accounting. When we hire, we use different ways to sort of analyze the individual. We use a predictive index, so, once the person is hired, they can succeed. Usually, the predictive index is going to provide the road to success whether the person is a leader or needs to follow instructions. It’s how you manage the individual. You get there by knowing their strengths and weaknesses. The biggest thing to grow the firm is you have to take risk. There’s always a risk to everything you do in order to grow and in order to be better. You constantly have to change what you do. I think when you look at risk, you have to analyze the situation and balance it out: These are the negatives, but if we succeed, these are the positives. As a CPA, I see many businesses, how they survive, grow and succeed. All that information has been downloaded through the years in my brain. Being a CPA and being knowledgeable about financial numbers, I can see the downside quickly. I can make decisions quickly. I like to take risks, but at the same time I want to understand them before I jump in. What are the type of risks you advise a business leader not to take? Are you willing to take the worst-case scenario? If you are not, are there ways you can reduce your downside to be able to get to the upside of that risk? You try to balance that out and make the best decision based on data. Talk about the evolution of the accounting industry during your career. When I first started the firm, it was 14 people and it’s at 660 today. We were a small accounting and tax firm with very little audit work. If you look at our firm today, more than 25 percent is derived from consultancies, whether it’s litigation support, valuations, our nonprofit consulting arm in New York, or our software consulting business in Coral Gables. When I started there were no computers. Today, you really need to use a computer—if not, you’re totally out of the business world. We’re constantly looking at how to work with an audit, such as looking at the data we have more efficiently. How can we understand it in analyzing the business. What new innovations do you have planned? Artificial intelligence is going to be more useful as it improves in the next three or four years. We’ve made major investments with [the American Institute of Certified Public Accountants] for the audit of the future. You will have computers you’re going to be able to talk to, and they will help you analyze data. You can send a drone out there and let them take pictures and do an inventory. You can scan and compare inventory with the actual books, and with blockchain you will see how you can work with it and be more effective. Blockchain could change the whole process by verifying information with an outside source like an auditor does. It will allow you to grab 100 percent of the data rather than the sampling you do nowadays. You are at an age when many people say they’ve done enough and are ready to slow down. Do you anticipate shifting gears? I don’t think so. I go to the gym four days a week, at crazy times, like 5:20 in the morning. I don’t anticipate shifting gears as long as I can wake up with the eye of the tiger like a human refugee should. If I don’t wake up with that dedication, then I’ll need to shift gears. What was the first philanthropic and charitable activity you became involved with? And what are some of the other highlights over the years? I remember I got involved in the Miami Film Festival. I was the treasurer and I think my main duty was to hide the checkbook from the executive director of the organization because we were short on money. I was involved in Carrollton [School of the Sacred Heart], which is a nonprofit—my daughter attended school there. I got very, very involved in the United Way. I was on life support in terms of church funding for me for five years and realized people were unfortunate in the community. I became involved in the Orange Bowl committee because of what it does for the community and football leagues, what it funds and improves. They have made facilities all around Miami-Dade, Broward and Palm Beach counties—running tracks, tennis courts, football fields. That’s what a nonprofit is all about. Your wife, Conchy, has been recognized for philanthropic efforts as well. Tell us about that. She is an amazing partner. We have been married 42 years. It will be 45 years that I’ve known her in May. She’s an amazing mother and grandmother. She is an amazing person who cares about our community in Miami. We have three great kids, Caroline, Tony and Andy, and three amazing grandkids that really fill up your time when you see them.